If you and I both sit down and look at Van Gogh’s Starry Night, we are likely to come away with two very different opinions on the painting. People interpret things differently, they see the world in varying lights. A vast array of viewpoints is what makes judging material so interesting. In many instances, there can be no wrong answer due to the large quantity of mindsets that exist. 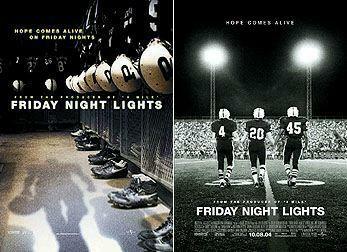 In this sense, comparing the novel “Friday Night Lights” written by H.G. Bissinger to its film adaptation of the same name is incredibly difficult. Both are spectacular and widely praised by critics. However, underneath the surface of the main plot exists differences between the two. They are separate takes on the same story. Both stories center on the West Texas town of Odessa and the local high school football team, the Permian Panthers. The focus lies with the town’s complete involvement with the team and the unique athletes who sacrifice for the team. In the most basic sense, the football program represents the identity of the town and its residents. The program is a necessary outlet, a distraction from the underlying economic and racial issues that plague Odessa. The movie is an excellent addition to the cinematic sports genre. The dialogue and acting is convincing and the story is relatable and real. 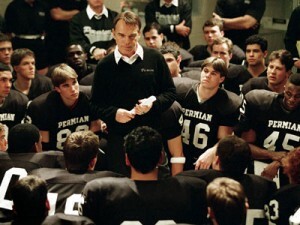 You leave the theatre focusing more on the human elements of the story rather than the football. Billy Bob Thorton admirably headlines a mostly unknown cast, carefully teetering between gruff authoritarian and gentle caretaker. Several of the younger actors hold their own as well. Derek Luke oozes charisma and confidence while also doing a fantastic job of revealing the softer side of injured star running back Boobie Miles. Lucas Black impressively underplays the reserved and focused starting quarterback Mike Winchell. The film’s cinematography and editing is also an attention grabber. The movie carefully sets the tone with tinted shots of the barren land in and surrounding the mostly impoverished town. We get a sense of the rustic and simple life that exists outside of the football stadium. One element of the movie that did not ring true, however, are the few fictional liberties taken by director Peter Berg. For example, the undercurrent of racism that divided the town is severely downplayed in the film. The racial tensions that threatened both the team and the town are more or less phased out for more focused story telling. Also, in order to cut down on running time, the film’s focus on individual players is fairly limited to Winchell, Miles and Don Billingsley. The book delves into more detail with its characters who are so rich and multi layered, you would swear it was all fiction. 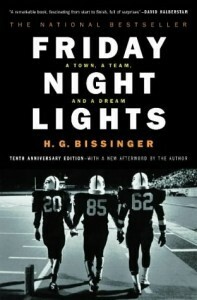 Bissinger takes the time to introduce the reader to several members of the football team and provide us with an in-depth glimpse into their lives. After he establishes many of these characters, Bissinger is then able to give the reader some insight into their minds. By cataloguing their home lives and upbringing, talking and interviewing the players extensively, and examining their choices and motivations, the reader gets an incredibly real sense for who these people truly were at that time. More so than the film version. It’s like you’re reading an entertaining and vivid documentary. While the movie does a great job, the book presents a better sense of Winchell’s innate separateness, Miles’ heartbreaking downfall and several other personal stories witnessed during the course of the season. Perhaps the biggest difference is Bissinger’s intense examination of the racial and economic issues engulfing Odessa. 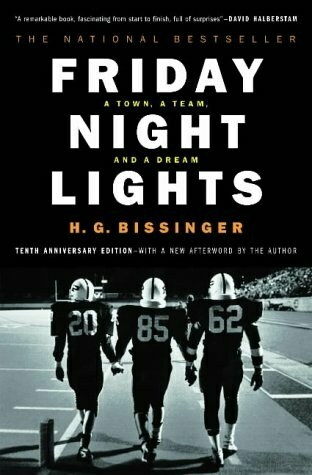 Bissinger even provides a detailed history of the civil rights movements that took place in the town long before this team came into existence. This focus provides a more worldly view of what is admittedly a provincial and prejudiced town. It allows the reader to gain a deeper understanding of the identity of Odessa and its unique culture. Every town has its skeletons, but the race relations and economic divide that existed in Odessa is a fascinating inspection of what is considered a true American town. Overall, Bissinger’s novel is the superior story of the two. Both are fantastically entertaining and come highly recommended by both book and film critics. However, the expanded scope of the book makes for a more moving and memorable experience.